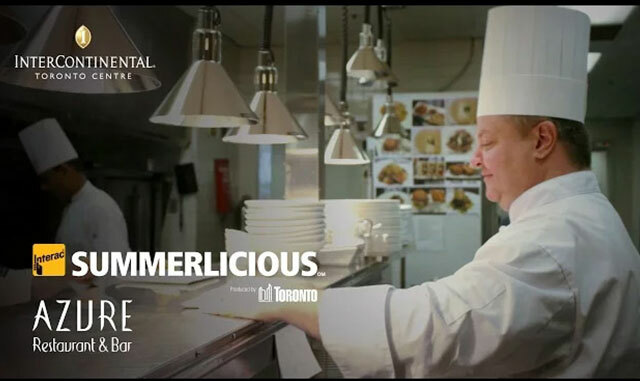 Executive Chef Shawn Whalen takes you on a video journey through the city to find inspiration for Azure Restaurant’s Summerlicious Toronto dining menu. Craving the buzz and energy of the summertime in Toronto? Join Azure Restaurant’s Executive Chef Shawn Whalen as he takes you on a video journey to find local inspiration for the Summerlicious 2016 menu. Summer is the time when Toronto truly comes to life. A feeling of abundance and freshness saturates the city, and the bountiful local produce invites you to explore, sample, sip, touch, and taste. Igniting creativity with its flavorful ingredients, the summer season has inspired the newSummerlicious 2016 menu at Azure Restaurant and Bar. Come along on a video journey through local markets and vegetable stands as Azure Restaurant’s Executive Chef Shawn Whalen searches – and finds – inspiration for his seasonal menu. Toronto is a melting pot of cultures and culinary influences, which creates exciting experiences for intrepid diners. In search of fresh flavors and a memorable Toronto dining experiences, gourmets and foodies converge at Azure Restaurant to enjoy the fleeting flavors of summer before they go. Showcasing the finest in contemporary Canadian cuisine, our innovative restaurant features dishes designed to take your taste buds off the beaten path. Relax in an elegant environment, and savor the moment the summer. Don’t miss your chance to indulge in Azure Restaurant’s tantalizing Summerlicious 2016 menu. Reserve your table online or by calling 1 (416) 597 8142. Make it a truly special experience by booking overnight accommodations at our luxury hotel, and treat yourself to a delightful summer evening whose memories will linger long after dessert.